Yesterday, I did a post describing home-ground advantage in various sports, and looked at three of the four factors that may influence performance at home or on the road. The plan was to tackle the effects of travel on home ground advantage in part 2, using some data from the Super Rugby tournament. But, once I began writing this post on the Super Rugby tournament, it was clearly a subject all of its own. So rather than try to squeeze too much into one article, I thought it would be best to have a Part 3, where I will look at the impact of travel on physiology. Of course, in Super Rugby, there is an additional factor affecting home-ground advantage, and that is the altitude (three teams – The Bulls, Lions and Cheetahs all play at 1,400m or higher). But that too will feature in Part 3. But for today, Part 2, I take a look at home-ground advantage in Super Rugby. Home ground advantage in Super Rugby – travel and altitude effects? I mentioned yesterday that the home-team has won 61% of the matches in the Super 14 competition, dating back 5 years. It’s possible to go further back, but the format has changed every few years, so we’ll stick to that duration for now. I analyzed every single result in the tournament and tried to tease out the value of home-ground advantage per team. Of course, this is historical data – it would be wrong to apply it to 2011 teams in isolation, but it’s interesting nevertheless. There are a three approaches to this problem. The first is to take home performances at face value, asking how likely the home team is to win the match. This is certainly the most intuitive and practical approach – it’s easy for commentators and analysts to look at the record books and say that “Team X has only lost once at home in 5 years”, assuming that their home ground advantage is responsible. This doesn’t take into account the relative strength of a team, it merely looks at whether they tend to win at home or not. The second method is to start looking at RELATIVE chances of winning home vs away. It uses win-loss ratios, and asks which team has a relatively better chance of winning away than others? The third approach is to look at more than winning and losing by considering also the points scored. By factoring in points differences at home compared to away over a prolonged period, you get an idea of what being at home is worth, both to the results and the points scored and conceded. Method 1: At face value, who has the best home record? So, overall, the home team wins 61% of matches. But some teams are clearly better – the Crusaders and Bulls, who have the best overall records (winning 73% and 65% of their matches), have won more often than they lose, both home and away. Their home records are outstanding – the Crusaders win 9 out of 10 home matches, the Bulls 8 out of 10. In contrast, the Lions and Cheetahs have won fewer matches at home than most teams have won away from home! Taken at face value then, the team most likely to be beaten at home is the Lions – they only win one in three matches at home, and so any team traveling to Johannesburg to play them is unlikely to hold much fear about the away match! In contrast, if you are heading to Canterbury to play the Crusaders, history suggests that you would not fancy the chances of an away win, because they win 9 out of 10 matches at home. What is important to realize is that their home ground advantage is a function of both the strength of their team and their playing at home. Both together make winning in Canterbury much more unlikely than winning in Johannesburg (Lions) or Bloemfontein (Cheetahs). But that doesn’t mean that being at home does not give teams like the Lions some advantage, and this advantage may even be larger than for the teams that win! The easiest way to understand this is to realize that if you are playing the Lions, it doesn’t matter much where you play them, you’re likely to win (they win less than a third of their matches, regardless of venue). It just happens that they are more likely to be beaten away from home. So the question should be relative (who is MORE likely to win away matches? ), rather than absolute. So the key is the odds. To illustrate this, imagine that home ground advantage did NOT exist – it was worth nothing to a team. Teams would win 50% at home and 50% away. Therefore, the ratio of away to home wins would be equal to one – you have an equal chance of winning, regardless of where you play. If home ground advantage was enormous (imagine infinite), then the home team would always win (making this 100%) and the away team would never win (0%) and so the odds of winning away would be zero. I have calculated an “odds away” ratio, shown in the far right column, which tells what the probability of winning AWAY is relative to winning at HOME. 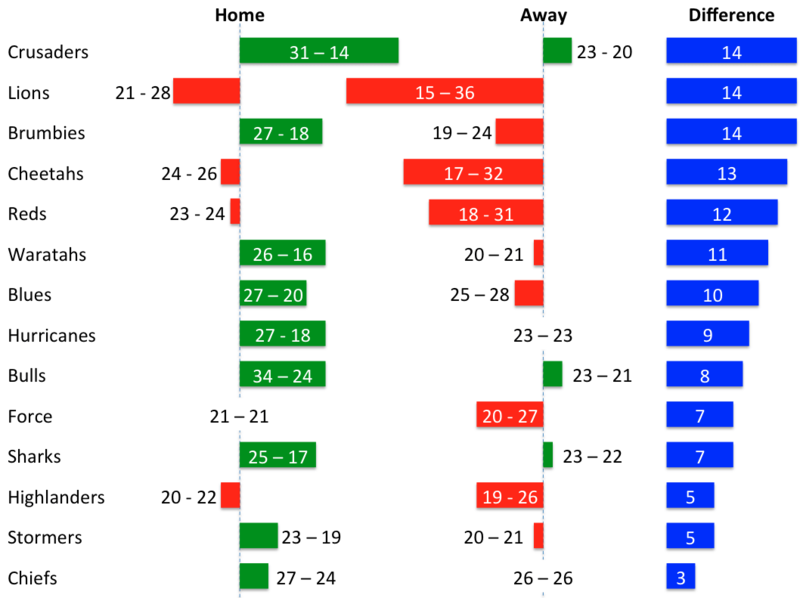 In other words, the closer the odds away value in that column is to 1, the better the chances of winning away from home, and hence the smaller the home ground advantage for that team (put differently, it means the team “travels well”, which is to say, their performance on the road is not much different to when at home). So, the teams with the best away records relative to home will have a higher “odds away” ratio, suggesting the smallest home ground advantage. They have been the Force (who are almost equal, home and away), the Stormers, the Reds and the Waratahs. To give a verbal illustration, the Stormers have an odds away ratio of 0.76. This means that if the chances of winning at home are 100% (which is never true, but work with me! ), then the chance of winning away is 76%. This is much higher than the Cheetahs, who would have a 35% chance away from home. If the chance of winning is 50% at home, then it’s 38% and 18%, respectively. So it’s interesting that two South African teams, the Lions and Cheetahs, who play at altitude, enjoy a pretty substantial relative advantage at home. Or, if you want to reword this, they are relatively much worse away than at home, possibly aided by the challenge of coming to altitude! The Bulls, the other altitude based team in the competition, have a smaller advantage – they win 79% home and 52% away, giving them away odds of 65.4% relative to home. It’s higher, but certainly not the highest in the tournament. They are a good traveling side – one of the few to win more often away than at home, and perhaps their greater ability away masks any altitude effect. The New Zealand teams, interestingly, travel well (all have high ratios of away:home win percentages) and so to them, being on the road matters less than to the other two nations’ teams. Quite why the Force have such similar overall win percentages home and away is interesting. It may be that a new team, they haven’t yet established their “home territory”, which makes their performances at home relatively weak. In time, that home win percentage may climb and they’ll come to resemble other Australian teams. Let’s look at points difference to consolidate this further. Method 3, Points differences: How much is playing at home worth? The next approach is to look at how teams score points home and away. The graph below is a summary of five years worth of Super Rugby matches, for each team, looking at their average scores both at home and away from home. Here, green means a positive record (winning matches), red means losing matches. Only three teams have had overall winning scores away from home, with two having tie-records. Four teams have overall losing scores at home. Once again, the key is home relative to away. Take a team like the Crusaders – they average a 31-14 win at home, and a 23 – 20 win away from home. Best team, historically, in the competition. This means that their home victory margin is 14 points better, on average, than their away margin, which is the size of the home ground advantage to them, in points. In contrast, look at the Stormers of Cape Town. They average a 4-point win at home, and a 1 point loss away, which means that home advantage is worth 5 points. And finally, consider the Lions, the tournament’s historically worst team. They lose by 21 points when away from home, but by “only” 7 points at home. This makes them the weakest home team in the tournament, in absolute terms, but relatively speaking, their home advantage is thus 14 points, similar to the Crusaders. I’ve shown the size of the home advantage for all teams in blue on the right. There are problems with this approach, of course – teams don’t play to score maximum points, they play to win and so a 21 point defeat and a 5 point defeat are not necessarily comparable as this method does. Also, it needs many more years worth of data to become statistically meaningful because strength of teams changes and so to do seasonal variations in performance. But, overall, it throws up some interesting observations. As we saw for the odds-method above, the Lions and Cheetahs have very good home records, relative to away. But they are still the weakest away teams in the tournament. 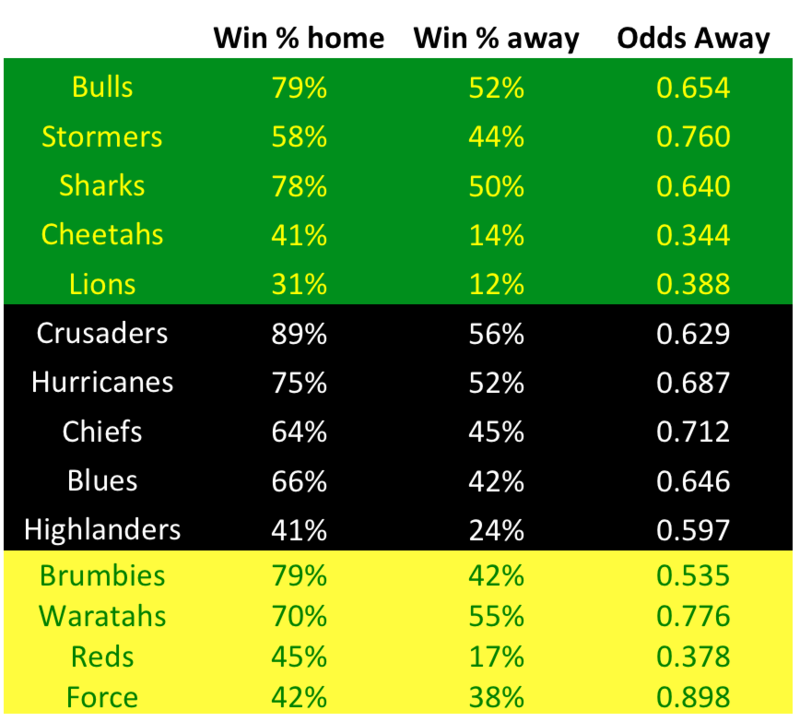 The Stormers, on the other hand, are not as good at home – their advantage is 5 points, and as we saw above, their odds of winning away are 76% of the odds of winning at home. Overall, they enjoy a relatively smaller home ground advantage. Interpretation of Super Rugby – large home ground advantage? Yesterday, I received an email from a bookie who said that his stats (bookies have great stats on this because they use odds to calculate bets all the time) showed that in Northern Hemisphere rugby, home ground advantage was worth 3 points. Taken together, the Super 15 data above have an average home ground advantage of just under 10 points. So home ground advantage, at least in this admittedly small sample (blame the ever-changing competition format and my lack of time! ), is greater for Super Rugby than for the equivalent northern hemisphere tournament. This does not surprise me, and I believe it exists for two reasons: Travel across time-zones and altitude at some venues. For these two factors, I think that Super Rugby is unique. Consider the travel: I am not aware of another competition where teams have to travel across so many time-zones so frequently with such short turnaround times (if you know one, let me know) In US-sports, teams will occasionally travel across North America, a five hour flight across four time-zones, but this pales into insignificance when compared to multiple half-day flights across up to ten time zones faced by Super 14 teams. Perhaps the only comparison comes from Sevens rugby, where teams fly around the world three times in a five month period. Tournaments like the World Cup or Olympic Games may of course involve big travel, but they last 4 weeks, and require no long-haul flights. If you’re counting, it turns out that the cumulative change in time zones in Super Rugby is 38 time-zones for South African teams (with 4 to 5 consecutive weeks spent away from home), compared to 20 time-zones and 2 to 3 consecutive weeks away for New Zealand and Australian teams. The greater time away from home is may be a factor – evidence exists that teams fare worse at the end of a long “road-trip” than at the beginning, but the issue of adapting to a new time-zone may be equally crucial for performance in the first week in particular. I’m busy doing an analysis on this right now – it’s hampered by the small size of the sample, but hopefully it will make for some interesting findings, which I’ll try to discuss in Part 3 if the data look anything but chaotic! One stat that I can’t ignore is that in 11 years, and over 32 matches, not once has the away team been able to beat the home team outside of its own country in a playoff match. It suggests a powerful effect of travel, because even though the odds should be stacked in favour of the home team, zero from 32 is a huge historical barrier to have to overcome. Then there is altitude. Here again, the Super Rugby tournament is unique. I don’t know of another tournament where teams can play a match at sea-level, followed one week later by a match at altitude, then sea-level and then altitude. That frequency of changes is unique – teams in US-sports play in Denver, a similar altitude to Johannesburg, but it’s once off. Teams in Europe rarely travel to altitudes higher than 700m (Madrid, for example). The altitude alone could create a significant home-ground advantage. It is interesting to note that the Lions and Cheetahs are so much stronger at home than away. That could be that they are terrible traveling teams, of course, but part of it may be that they benefit from the effect their altitude has on opposition teams. Taken together, the combination of travel and altitude is a huge challenge for a Super 14 team. Earlier this season, the Highlanders, a team from New Zealand, undertook the 10 hour time-zone change to fly to South Africa, landing in Johannesburg. They then played the Lions, at an altitude of approximately 1,600m, and then fly to Cape Town, and then back to New Zealand. In and out within two weeks, but with the dual challenges of altitude and travel. The travel issue is especially interesting. Tomorrow I’ll do a short post on travel and the role it may have on Super Rugby home-ground advantage. It may be impossible to get anything out of the analysis I’m trying to do, because it may take decades and hundreds of matches, but we’ll see! So join us then!